Recently I had the opportunity to travel to Vietnam with the MARL Program. This is one of the reasons the Swine Extension Newsletter is coming to you a little later in March then I would typically send it out. My Vietnam trip was from February 19 – March 2nd. For those of you not familiar with the MARL program, MARL stands for Minnesota Agriculture and Rural Leadership. It is a leadership development program for active and engaged adult agriculture and rural leaders offered in partnership through University of Minnesota Extension and Southwest Minnesota State University. I am a member of the current MARL Class VIII. MARL Class VIII traveled to Vietnam for our international experience. It was a once in a lifetime experience with all of the sites and learning opportunities we participated in. Below is a summary of just some of my experiences. Our trip started in Hanoi, which is the capital of Vietnam and located in the Northern region of the country. In this area we saw many rice fields as we drove through the countryside. We even talked to a local rice farmer while she was planting her rice. She was planting rice by hand. The plot she was planting at the time was about ½ an acre and it had taken her about 3 – 4 days to plant ½ the plot. 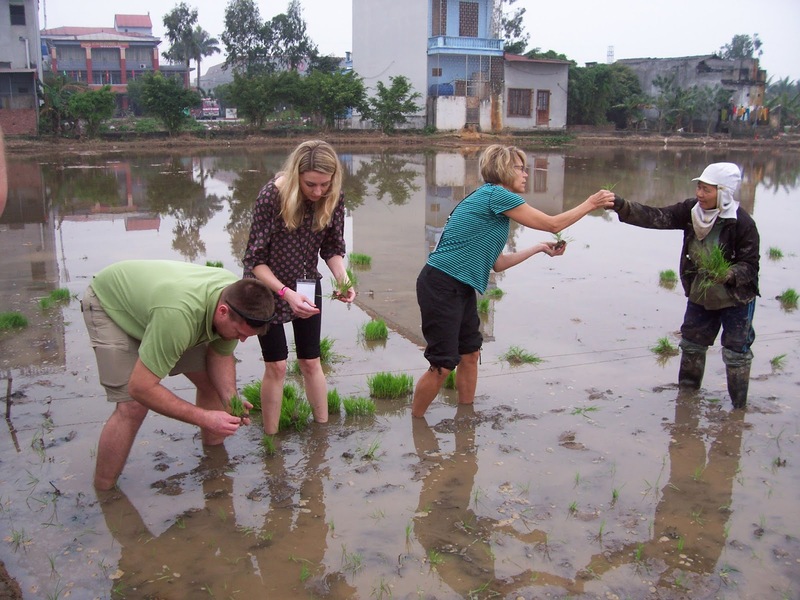 Three MARL Class VIII members got in the water with the farmer to try their hand at planting rice. 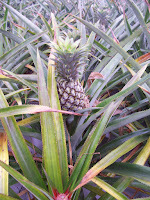 In the Ninh Binh area of Vietnam we visited a pineapple farm. The pineapple farm was the largest in Vietnam. 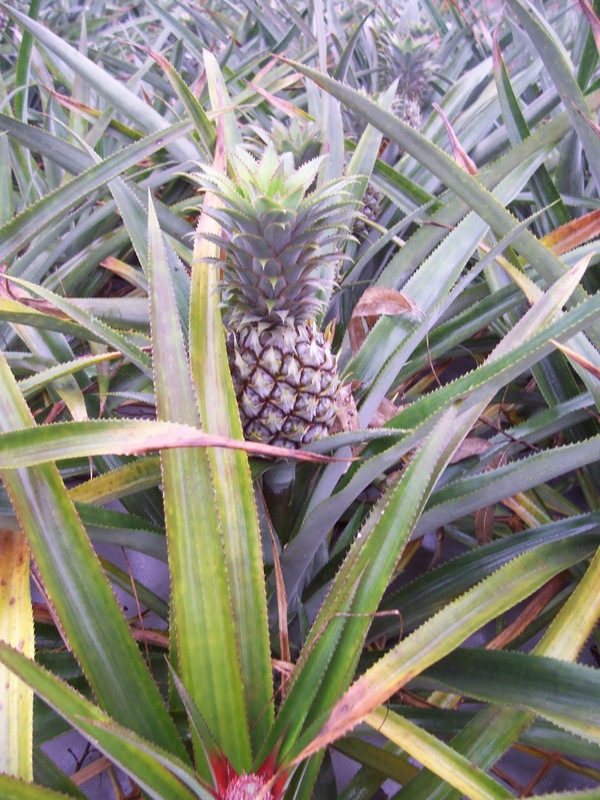 The land was owned by the government, but farmers in the area had the job of tending to the pineapple fields. The family that tended the pineapple fields were very hospitable serving us tea, showing us their kitchen, which was detached from the house, and having what seemed to be endless time to share farming experiences with us. Back in Hanoi we were able to spend a morning talking to four U.S Embassy Representatives in Vietnam serving as the Political Officer, Economic Officer, Environment, Technology and Health Unit Officer, and the Foreign Agriculture Service Officer respectively. We learned from these individuals that the U.S relationship with Vietnam is very strong. Vietnamese consider our relation as comprehensive, meaning they feel comfortable speaking to the U.S about all things. The good relationship was definitely experienced by the MARL Class VIII members as we traveled through the country and visited the various places. Vietnamese seemed very eager to build relations and learn from us. 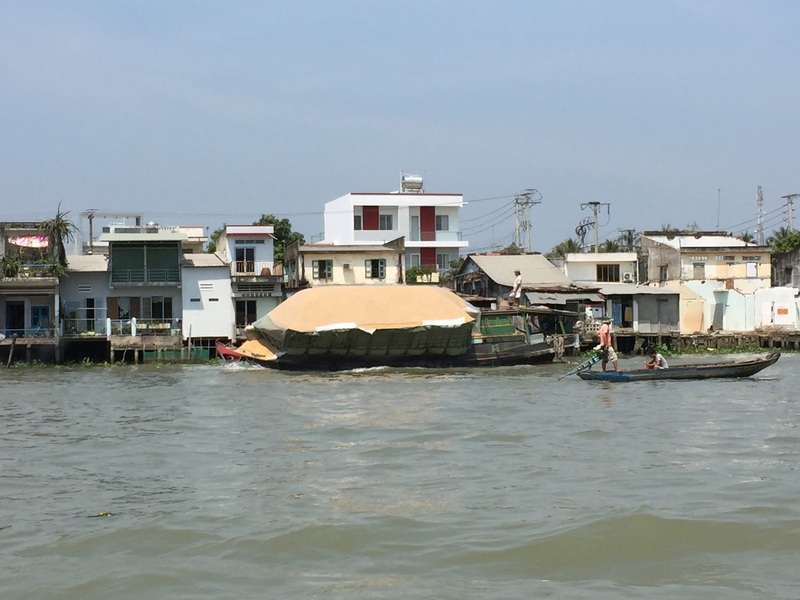 After spending a third of the trip in the Northern region we traveled to Hoi An, which I consider to be the East Central region of Vietnam about 20 km South of Da Nang. Da Nang was once a huge U.S military base, but now a thriving coastal tourist destination and business center. Many of us bought the majority of our souvenirs in the market area of Hoi An which was full of shops of all kinds. The Hoi An market area has a long history of being the place centuries ago where merchants from neighboring providences brought their items to sell. 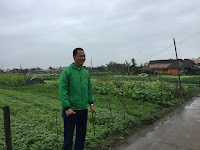 Also while in Hoi An we took a bike ride through the country past numerous rice fields, a large vegetable and herb garden, a few small corn and sugarcane plots, a duck farm, and grazing cattle. Our bike ride ended with a boat ride through what the locals called the jungle. This area was basically a water area with bamboo and palms growing in it. We were told during the war it was where the Vietnamese troops hid under the water while they breathed through the bamboo stalks, which they used as straws. The last third of our trip was spent in the area of Ho Chi Minh City in the Southern part of Vietnam. Prior to the war Ho Chi Minh City was known as Saigon and still is referred to that depending on who you talk to. Some of the highlights from this part of the country were touring the Reunification Palace, Cu Chi tunnels, a hog farm, rubber tree farm, lacquer factory, and seeing an AO Show at the Saigon Opera House. Reunification Palace is where the North Vietnamese Army crashed through the gates of the palace to raise their flag and end the Vietnam War. The Cu Chi tunnels were used during the war by the Vietnamese Guerilla to congregate and move from place to place while being undetected by the U.S military. year. The farm specialized in raising Landrace and Duroc boars. Similar to a barn office in the U.S, the farm we visited had a big white board with current production stats for the farm. A stat that caught my attention was their average litter size born alive of 10.25 piglets with 8.95 being their average piglets per litter weaned and 17.23 pigs per sow per year. I quickly asked how their sows farrowed, meaning in pens or crates. 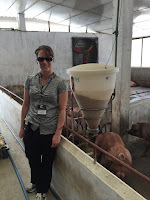 Although we were not able to tour the farrowing barn, the farmer told us the sows farrowed in farrowing crates similar to common practice in the U.S. The weaned pigs were finished in curtain sided cross ventilated barns with solid floors. The pigs were fed a typical corn soybean meal diet. The farmer said he raised some of the corn in his fields, but a majority of his corn soybean meal was imported. Manure was collected and ran through a methane digester. The solids were applied to the fields as fertilizer. I wish we could have spent a longer time at the hog farm because I have many more questions for the farmer. I know not all pigs in Vietnam are raised like we experienced on this farm, so it would have been nice to see a less progressive pig farm too. Delta. 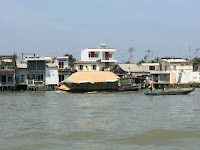 While we drifted through the canals we saw many boats carrying rice, rice hulls, sand, fruit and many other products. We made a stop to visit a fruit farm and a cottage factory. The fruit farm had numerous fruit trees growing various kinds of fruit such as limes, jack fruit, coconuts, pummelo, bong bong, quagac, and passion fruit. At the local cottage factory we witnessed people making coconut candy, puffed rice, rice paper, and rice wine. Our trip concluded with a visit and tour of the TCIT (Tan Chang – Cai Mep International Terminal) Port. TCIT is a joint venture established in 2009 by Saigon Newport Corporation and three leading shipping companies. The terminal has service routes of Europe, U.S West Coast, U.S East Coast, China and Japan. Overall I am glad for the opportunity to visit Vietnam through the MARL program. It was great to learn about agriculture in another country and further my leadership skills.